This is one of three ocean view units within a triplex. Come stay at one of the best located and nicest ocean view condos in all of downtown Pismo Beach. 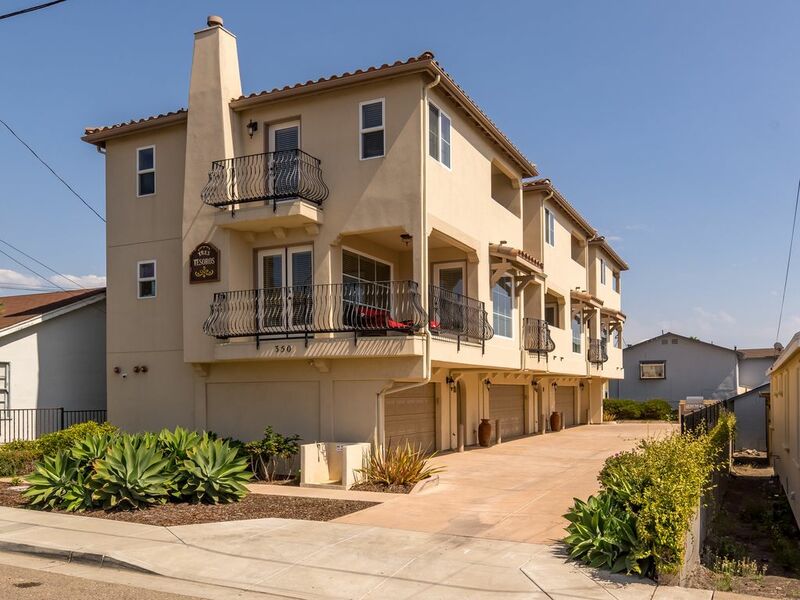 La Casita de Bailyn (Condo B) is a beautiful location in the heart of downtown Pismo Beach. It is located at 350 Harloe Ave. approximately 2 blocks to the ocean. You are walking distance to the beach, restaurants, pier and parks and just about anything else you want to do here. Longer term stays take priority, 30 nights or more. We may consider shorter stays but only if not booked. Ask the owner/property manager. Condo B is named La Casita de Bailyn, within the Tres Tesoros Tri-Plex complex. Tres Tesoros means three treasures. This treasure has two bedrooms/two and a half bath. The ocean view condo has a nice family room for entertainment with a flat screen television. There is also a flat screen in both the master bedroom Cal King Room and in the full over full bunk room. In addition, there is another twin bed. These two bedrooms share a full bathroom. There is a full kitchen off the family room. The family room has a sofa and one ottoman that makes into a single bed. The dining table seats six. The condo is fully furnished with all the necessities of home and maybe more. There is an ocean view balcony with chairs and table to relax and enjoy the views up and down the coast. There is a built-in-shared gas BBQ and foot wash, iron and ironing board, washer and dryer in the 2 car garage, Wi-Fi and DirecTV. No Pets, No Smoking. This condo sleeps 4-7 maximum occupancy. To view all the condos, please see my other listings. Condo A is VRBO# 195553 and Condo C is listing # 195618. Property is also viewed Treasures Vacation Rentals. My husband and I completed construction on Tres Tesoros in 2006. We spent about a year designing the Tri-plex. We named the building Tres Tesoros after our three wonderful children. Each condo is named appropriately after one of our three children. We have Condo A... La Casita de Amelia, Condo B... is La Casita de Bailyn and lastly, Condo C is La Casita de Colton. We also have some other properties located just south of Pismo Beach in Oceano, CA. View All My Rentals below Rates. Each bedroom has a full bath within. Located in the heart of downtown Pismo Beach. In the garage. Front load washer. In the garage. It's a front load dryer. on street or in garage. Limited to 7 feet height in the garage. Big enough for one SUV or two medium sized vehicles. Washer and dryer are located in garage. Garage has a 7 foot height maximum. Towels for showers are in the bathrooms and beach towels are in the garage for your use and convenience. Please do not take them with you. Oven and stove and warming drawer. Some condiments and spices. We don't supply them, but we don't remove them unless they are expired. Is in Shell Beach or the local high school. There is also pickleball in SLOC. Golf is in Arroyo Grande, Avila or San Luis Obispo. All not far. Stairs do go from the ground level to a landing, then another flight of stairs to the front door. All bedrooms are on the third floor. Downtown Pismo Beach; 1.5 blocks to Beach, walk to restaurants, Pier, Beach, walk to the beach! Wineries are within 15 minutes. Pismo Beach offers many activities and events throughout the year. It is a highly sought after destination anytime of year. This is one condo (Condo B) but for larger groups we also have two more condos at this same property. There are also Condo A and C. These can rent in any combination. This was a perfect stopping point from picking up our son from UCI. We spent five days in this Condo with a family of five and had plenty of room! This condo was perfect: well-equipped, clean, near to the beach, and many good restaurants. Everything was within a very short walking range (literally 2 blocks to beach and just about 3-4 blocks to many of the restaurants). This was a perfect getaway for our family! We will visit this Condo again! This condo is well appointed and quite comfortable... So much so that when it poured down rain on our first full day there, the kids didn't mind just hanging out and playing cards all morning. Once the rain stopped its a short walk to the beach and the pier, but far enough away from the downtown that evenings were quite peaceful. Would definitely come again! Our son was getting married in Pismo Beach and we had extended family coming from out of state with 2 babies. Tres Tesoros, Condo Bailyn and Condo Colton, were perfect for our families. There was only a short private breezeway between our condo doors so we could easily go back and forth to visit. The condos were very clean and nicely decorated with well stocked kitchens and baby items. Just a short walk to the beach or pier area, but yet slightly removed. A perfect place for family gatherings. Great condo. It was very clean and comfortable. Right downtown, you can walk to good restaurants and the beach. Just as nice and just as wonderful as our visit last month. Would recommend to ANYONE who is looking to stay at Pismo. See you next year. We thoroughly enjoyed our stay. The management team is sharp and responsive. The property is very well designed, built and maintained. It was in such good shape that I thought that it had just been built earlier in the year. The location is excellent, within walking distance to the pier but not amidst all of the congestion. The building is remarkably quiet. My one note of caution is that there doesn't appear to be any true convenience stores within walking distance and the nearest supermarket is a drive away. There are plenty of restaurants, coffee shops, liquor stores, etc. nearby but you have to drive bread, milk, eggs, etc. Wineries are within 15 minutes. Bi-plane rides at Oceano Airport, Sand Dunes and beach are short walking distance. ATVs can be rented on Pier Ave. Property is in the heart of downtown Pismo Beach, walking distance to the beach, pier, restaurants, bars, shopping, bowling, athletic club, etc. Pricing is subject to change until booked. No Pets or Smokers. Minimum age to rent is 25 years of age.